Do you ship Letters to Army and Airforce Post Offices (APO) and Fleet Post Offices (FPO)? We support mailing to APOa and FPOs all around the world. Does Sandboxx send Letters to APO and FPO? You can send Sandboxx letters to overseas military addresses (APO/FPO). Those letters stand for Army Post Office and Fleet Post Office. Generally, overseas mail for Army and Air Force personnel go to APOs and mail for Marine and Navy personnel go to FPOs. However, that is not a hard and fast rule, so use the APO/FPO that you have from you recipient. What about sending to Europe, the Middle East or Africa? Is there anything special I need to do? Yes. Basically whenever you write a letter to an "APO" or "FPO," they should also be designated "AE" (for Europe/Middle East/Africa) or "AP" (for all Pacific locations). How should I address these letters? 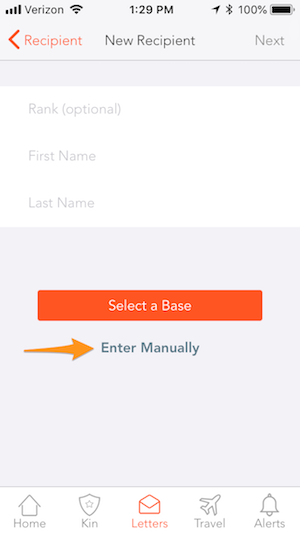 To send to these addresses, choose manually address on the New Recipient screen". Put the "APO" or "FPO" in as City and "AE" or "AP" in as State, depending on what region you're sending to of course. Enter the zip code in Zip. Do you have an example of what the address should look like?